This morning around 10 a.m., I grabbed my jogging stroller, threw on some exercise pants, long sleeves, sunscreen, and a trucker hat and headed out the door. I got my children comfy in the stroller with books and toys and made sure they had protection from the sun too. In my neighborhood, there is a paved parkway for runners and bikers that I take full advantage of during the warm months here in Utah. Stroller walks and runs on straight pathways make for a more enjoyable ride for the children. As I was walking up to the trail, I saw this sprightly elderly woman mowing her lawn. I walked passed her and asked if she needed help and she explained to me that by mowing her lawn, she was getting her exercise in for the day. Her yard was pristine and I could tell that she takes pride in her home and health. She said thank you anyway and commented how cute my children were in the stroller. I left her yard smiling at the positive vibe she left me. Once my children and I got home from our walk, I put my son down for a nap and went outside with my three-year-old daughter to mow the lawn. After seeing this beautifully aged woman, I was reminded how exercise and daily movement is essential in preventing osteoporosis and muscle wasting as our bodies age. Choosing simple ways to move our bodies, such as mowing a lawn or pushing a stroller, are easy ways to get in daily exercise. Mowing the lawn and pushing a stroller are similar movements and I wanted to share why doing both can improve your health. Walking is a form of aerobic exercise that improves circulation and helps the body better use oxygen. Walking strengthens the heart and cardiovascular system. When pushing a stroller or lawnmower, you are pushing extra weight, therefore, making your body work harder. It is important to engage your core when pushing a stroller or mowing the lawn. Both activities are great ways to engage and strengthen the core. When doing those activities, be cautious not to improperly twist the spine. As a postpartum mom, a strong core helps to keep up proper posture and body alignment. As a mom, your kids are kinda stuck with you. Ya, feel me? It is not recommended to leave young children alone while you go on a run by yourself or do yard work for an extended period. Therefore, bring your kid(s) along with you in a stroller. While you work in the yard, strap a kid on your back or let them play in the yard. Teaching children to take care of their bodies and the environment around them will do both them and this world some good. Spending time outdoors has documented health benefits. When we are exposed to sunlight and natural living things, it helps synchronize our circadian rhythms. Time spent outdoors helps us become mentally and physically grounded. 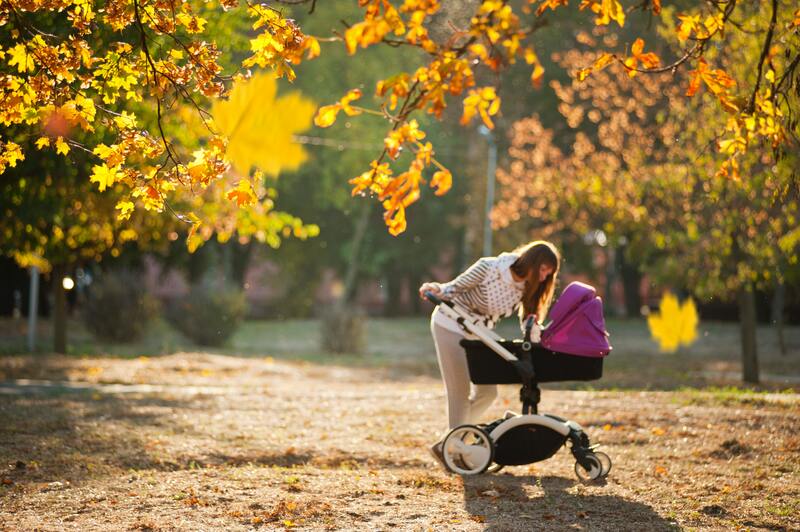 Being outside improves your sense of well-being and helps your body produce vitamin D.
When taking children on a stroller walk or spending time outdoors for an extended period, have snacks, sun protection, toys, water, and children who have an empty bladders. These are easy and great ways to keep up an enjoyable experience outside. Walking is a great way to introduce exercise into a sedentary lifestyle. In my article, Workout Motivation and Goal-Setting, I share how to set fitness goals and tips to meet them. A good goal to set is walking 10,000 steps a day. Read the article to start creating a goal, like getting in 10,000 steps a day, to help you have greater health and fitness.